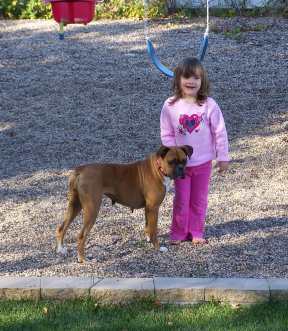 Mary and George, the neglected breeder Boxers from KY, are adopted! Readers might recall the long post about the rescue of Mary and her companion George a few months ago. Mary was a neglected, sick, skinny, breeding Boxer kept in an old abandoned building in east Kentucky. She and George were rescued and transported to the Minneapolis/St. Paul region by Minnesota Boxer Rescue and I was one of the relay drivers who brought her to the north. Many people were involved in her rescue and rehabilitation. I was very moved by her sweet, loving nature and her terrible early life. Mary was treated for heartworm and other ailments and her loving foster mom and dad taught her how to be a house dog. They made her adoptable and deserve much of the credit. Read the original post about Mary here. George was adopted by the knowledgeable, loving foster family who cared for them both. They wrote that they just couldn’t part with him. See George and his four-legged family at right. George is top row, right; look at this excellent group sit! Since Mary and George’s families are only about 45 minutes apart, they have had a few play dates. To everyone who had a role in Mary’s and George’s rescue and recovery: BLESS YOU, it was worth it. Big time! Bless your kind heart. Bless every one of you. Every minute, every dollar, every mile. Mary and George no longer eat old kibble off the icky floor of an old empty building. They don’t suffer from parasites any more. Mary’s eyes and nose are healthy and clear. She has a big soft bed and watches TV with Dad at night. 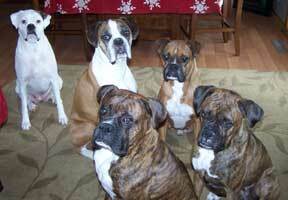 George is adored by his new family and he plays with four Boxer siblings every day. They both bring joy to their new families and bask in their love every day. THANK YOU everyone! Hi there, Mary’s new mama here. I just want to say THANK YOU to everyone involved with Mary. Thank you for not giving up on her. Thank you for your time and love and financial investment. We are SO blessed to have her as part of our family, and it would not have been possible without every one of you. Thank you, thank you, thank you!! At times my heart is so tattered and torn from holding the remnants of human cruelty in my arms, my soul goes numb. in need of the basics, food, water, medical care and love. Dear Moran, you did so much to save and foster and vet and love Mary and George … God knows how many hundreds of others you have saved through your wonderful work. You are a hero in my eyes. I would hug you if I could. What a great ending to such a horrible beginning situation. My thanks to all of you for your part in this inspiring story!